Get the Full StoryAlternative stats give more weight to a fighter s recent performances. Get statistics overload and see what they have to say for Saturday s UFC 226 fight card in Las Vegas. It s International Fight Week and the big boys are stepping up for only the second true UFC champion-vs-champion matchup since B.J. Penn s corner put an end to his Georges St-Pierre rematch nine and a half years ago at UFC 94. The numbers are crunched and ready to go as light heavyweight champion Daniel Cormier is probably loving the taste of fight week food with no weight to cut in his return to his old heavyweight home to face Stipe Miocic, the man with the most consecutive title defenses in the division. As with all recent International Fight Weeks, there s a smaller event on Friday where the TUF 27 Finale and Saturday s UFC 226 couldn t be more different from a predictive analytics point of view. TUF 27 has zero eligible fights thanks to an Israel Adesanya main event, some of the female fighters making an appearance, and the usual cast of TUF characters new to the promotion. Meanwhile, the main card of UFC 226 will miss predictions for the main event and the #3 spots due to heavyweight matchups, but we can still give a detailed breakdown of the fighters alternative stats tendencies at distance, in the clinch, and on the ground as we get ready for what should be a fun weekend for lovers of regulated violence. Remember, what you re about to read are not official UFC statistics. They re alternative stats generated from official statistics designed to 1 give more weight to the recent present than the distant past and 2 not let one huge or horrible performance dominate the data. All fights start on the feet, and when they re at distance, Miocic and Cormier have very similar head jab statistics with average volume and above average 36 accuracy. 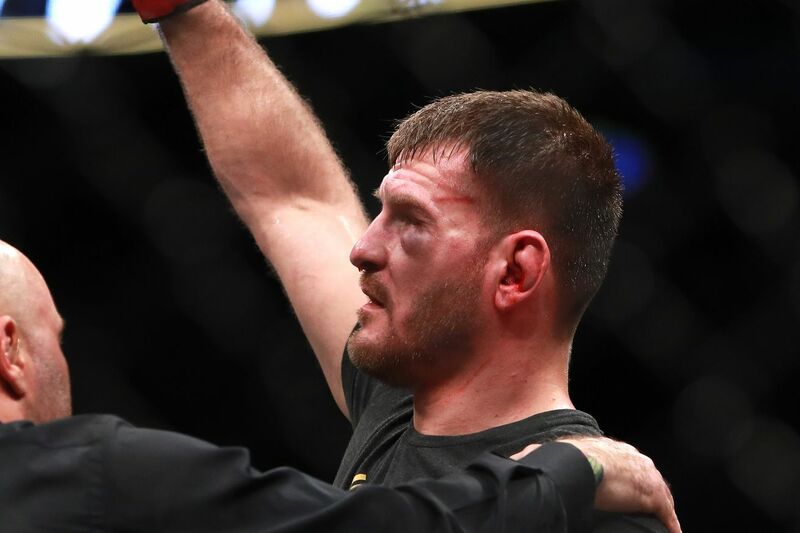 When it comes to power strikes, Miocic is more of a head hunter, throwing 28.8 shots to the head and only 2.4 to the body legs per five minutes in the position P5M . Cormier mixes things up a bit more at 23.1 and 5.0, respectively. But while Miocic tends to target the head, he s been extremely effective, landing 46 of his head power shots 31 average and outlanding his opponents by 6.1 P5M while Cormier s been on the absorbing end of 2.0 more. The power advantage, so far, is easily Miocic. He busts up an opponent s face in 11.7 of his rounds 0.5 Cormier , has a distance knockdown rate almost 8x that of Cormier, and a knockdown percentage that s 10.3x Cormier s. And when it comes to getting knocked down, the two fighters are pretty similar. If the fight stays at distance where Miocic spends 3:40 of every five minutes, the alternative stats scream support for the heavyweight champ. But Cormier doesn t generally just sit there and let a pure kickboxing match play out in an MMA cage, spending almost half of every five minutes either in the clinch or on the ground. When getting to one of those positions, both men have excellent distance takedown shots and use them more than an average heavyweight, but both also defend exceptionally well stuffing 97 Cormier and 95 Miocic . Cormier does work in the clinch, outlanding opponents with power by 8.9 strikes P5M and the man s been clinched up with Jon Jones, twice. Neither fighter s exceptional statistically in their clinch takedowns, but the same goes for their defense. Each defends in the range of 72-70 , a far cry from their rock solid 97-95 distance defense. If there s a possible takedown weakness for Miocic, it s lower body takedowns where he s succumbed to 2-of-3 attempts, and Cormier certainly knows how to work to a clinch and is most active with attempts targeting the lower body. On the ground, it s one of those matchups where each fighter knows how to be on top and gets the hell up in the rare case they end up with their back to the mat. Miocic and Cormier spend 98 and 96 of their respective ground time with control where Cormier, a BJJ brown belt, has half guard or better 65 of the time. But he may not get to use it much as both fighters rocket back to their feet 9.8x Miocic and 10.5x Cormier faster than a typical heavyweight, understanding that if you re on your back there s a good chance you re losing in MMA. For fun, when win probabilities come out on Saturday at 6pm ET, I ll throw out numbers for this fight by coding Miocic and Cormier both as light heavyweights. But there s no official pick. From the grizzled veterans of the main event we move to the co-main matchup of young featherweight studs. Wait, at 26 years old featherweight champ Max Holloway has more documented bouts than both Miocic and Cormier. Dammit. You know what I meant. Let s start with the obvious here, the striking matchup is not pretty. Less obvious is just how unpretty it is. Both fighters spend most of their time at distance with Holloway at 3:55 per five minutes and Ortega about 30 seconds less. The champ s a volume machine throwing 31.7 head jabs and 52.4 power strikes P5M, landing 24.2 of the latter which exactly doubles Ortega s rate. Perhaps more importantly, Holloway outlands opponents by 5.8 head jabs and 7.0 power strikes P5M while Ortega checks in at 3.6 and a terrible -21.4. No that last number s not a typo, but it s been weighted by more recent fights against tougher opponents. Although if we forget about alternative stats weighting, Ortega s lifetime distance power differential is still ugly. Ortega s possible advantage at distance is power, in addition to the threat of snatching a guillotine from pretty much anywhere. He s busted up faces at 9.3x the rate of Holloway and dropped opponents with a 3.3x knockdown percentage and 1.5x knockdown rate compared to the champ. The only problem is Holloway s never been dropped and that includes three full rounds each with The Notorious One and Jeremy Stephens and six rounds with featherweight legend Jose Aldo. When it comes to changing position, neither fighter spends much time in the clinch and neither does much cage pressing. Holloway rarely attempts a takedown of any kind and Ortega rarely shoots for takedowns at distance. Ortega s takedown game is attempting 92 more volume than a typical featherweight in the clinch. All to the lower body, he lands at a much to be desired 28 rate where again he runs into another problem. Holloway s alternative stats lower body takedown defense has been an outstanding 94 . If it gets to the ground, I would ve expected Holloway to have a higher standup rate with it currently sitting at a subpar 1.6 P5M while being controlled 2.4 average . Holloway s usually on top where he has threatened with a submission or two, but his real work is 71.6 power shots landed P5M 15.5 average . Ortega has half guard or better 68 of the time he has control, and whether on the ground or standing, is always a submission threat with finishes in half of his eight attempts. While endurance is hard to measure, Holloway throws distance power shots at a 62.9 higher rate in the third round relative to the first. Seemingly a great Holloway statistic, Ortega s then comes in at 61.9 . So the gas tanks on these two studs don t seem to be much of an issue. Neither fighter has any data outside the third round, but they should be good to go the full 25 if need be. Time to move on to the next fight. I m getting pumped up just thinking about this one. Bring on Saturday night! There won t be a prediction for this fight, but here are some alternative stats anyway for fun. Lewis is known to be in back-and-forth affairs and his bout closeness measure shows it, coming in at more than double that of Ngannou. At distance, big surprise, these guys drop bombs. They throw more power volume than a typical heavyweight, perhaps surprisingly given Lewis tendency to look gassed or need to go #2. Their knockdown rates come in at 6.6x and 3.2x the heavyweight average Ngannou then Lewis and they hardly ever shoot for takedowns. Although here s hoping Lewis gets taken down one time to bust out his Eff you, I m standing up. Good luck trying to choke me out move. It s the best. The first thing that stands out in the mega-stat sheet is these guys tend to take damage at a high rate. Fun for the bloodthirsty, they throw with high volumes when not clinched up. For Chiesa, it s really when he s at distance since he s generally working for a takedown or defending in the clinch and working for a submission on the ground. Landing 24 of his head power strikes at distance to his opponents 37 , Chiesa doesn t strike terribly well in the position. But he does throw 13.3 more head jabs P5M than his opponents and if the point of his distance striking is to set up takedowns, blitzes, and clinches, his takedown numbers while not spectacular do tend to show it. Pettis weakness has always been his takedown defense which sits at a subpar 56 at distance and 42 from the clinch. He stands up from the bottom at an average rate but has a sweep rate that s 3.5x the lightweight average. Here s hoping Chiesa gets his back at least once so we can see if the Pettis sweaty spin works yet again. Predictions can be made for five of the 12 scheduled bouts. Be sure to return to Bloody Elbow this Saturday at 6pm ET for precise win probabilities and possible bets shortly before UFC 226 starts. Notes: Strike attempts are for an entire five minute round in each position P5M and are categorized as jab or power. A jab is just a non-power strike. Strikes are documented based on where they land or are targeted head, body, legs , not the type that is thrown punch, elbow, kick, knee . Visible damage rate is per five minutes the fighter is not on his back. It s hard to bust up someone s face while lying on your back. Damage percentage is per power head strike and distance head jab landed. Knockdown rate is per five minutes at distance or in the clinch off the cage. Knockdown percentage is per power head strike landed while standing. It s really hard to knock someone down if they re already on the ground. Clinch control is having the opponent pressed against the cage. Ground control is having top position or the opponent s back. Submission attempts are per five minutes of ground control minus time spent in the opponent s guard plus time spent with the opponent in guard. A bout closeness measure towards zero means a fighter is in blowouts win or lose and towards 100 means he is in very close fights. Paul writes about MMA analytics and officiating at Bloody Elbow and MMA business at Forbes. He s also a licensed referee and judge for the California Amateur Mixed Martial Arts Organization CAMO . Follow him MMAanalytics. Fight data provided by FightMetric.